Banks are not easy to work with these days and I strongly suggest using a local lender. On-line lenders can look good but when it comes down to getting it closed on time they typically fall short. This can cost you the house and your earnest money deposit. Self-employed persons will have a more difficult time getting a mortgage with tax returns being the only basis for income qualification. Buyers who make a significant part of their income from profit sharing, bonuses or commissions will also have to prove a history of income if those funds are needed to qualify. I do recommend that you use a local lender (see below for my favorites) rather than an out of state or virtual lender. They are oftentimes far more difficult to deal with, and do not save you any money! We have had more problems with the big banks than with local and regional banks, so I don't recommend Wells Fargo, Chase or Bank of America. To get an idea of what you can afford, try some of these calculators at Guild Mortgage. The most common inspections are the Whole Home Inspection which includes pest and dry rot ($500-$700); Sewer Scope ($140); Radon Test ($160) and sometimes a Tank Locate ($100) to look for buried oil tanks. We have lists of the best inspectors in Portland. Inspections and repair negotiations are where an experienced Buyer's Agent really pays off. Knowing which issues are serious and where to get more information and repair estimates is something we are very good at. We have worked with some of the same contractors for many years and have great relationships that can be of benefit to you. 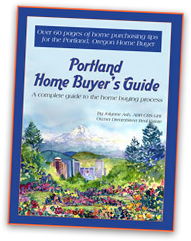 The following link contains the Oregon Property Buyers Advisory. It is designed to assist home buyers in understanding the different types of inspections that are available. It also explains (in layman's terms) the laws governing real estate transactions in Oregon, and explains many of the clauses found in the Earnest Money Agreement. I especially like the links to everything from crime stats to utility information. 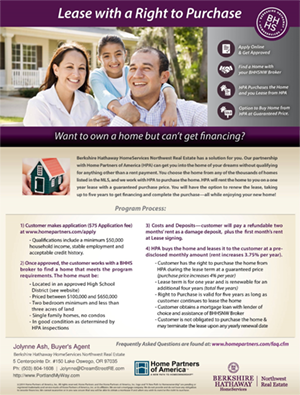 This really is a MUST READ for all first-time home buyers. It is a PDF document that can be printed.